Albert Whitman & Company, 9780807581438, 304pp. Life in a 1905 Nevada mining town is not easy for any thirteen-year-old. For Kit Donovan, it seems downright impossible. When her mother dies of a fever, Kit is certain she is to blame. Guilt-ridden, she is determined to honor her promises to her mother—namely to be a “proper lady.” Only being a lady is tougher than it looks. When Kit discovers that Papa’s boss at the gold mine (the menacing and self-serving Mr. Granger) is profiting from unsafe working conditions in the mine, she convinces her dad to speak out. But sometimes doing the right thing leads to trouble. Now Kit must find a way to expose Granger’s misdeeds before it’s too late. 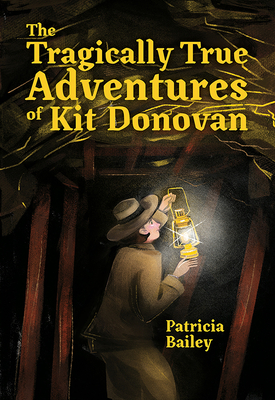 Aided by an eccentric woman, a Shoshone boy, and a drunken newspaperman, Kit puts her big mouth and all the life skills she’s learned from reading The Adventures of Huckleberry Finn to work. With a man’s hat and a printing press, Kit defies threats of violence and discovers that justice doesn’t always look like she imagined it would. Patricia Bailey has a BA in English and an MA in Education. She lives in Southern Oregon, where she’s taught literature and writing to teens and adults. A recipient of an Oregon Literary Arts Fellowship and a Fishtrap Fellowship, Patricia writes novels for young people.